Our thoughts are with the Notre-Dame Cathedral, one of the most famous and enduring cathedrals in France, perhaps even all of Europe. The cathedral was begun in 1160 under Bishop Maurice de Sully and largely completed by 1260. Other additions were made later, but the main structure took 100 years to complete. The cathedral is considered to be one of the finest examples of French Gothic architecture. 2013 marked the 850th anniversary of the Notre-Dame Cathedral. The Cathedral's flèche or spire, which was destroyed by the fire, was located over the transept and altar. The spire was surrounded by copper statues of the twelve Apostles, in groups of three, one group at each point of the compass. Each of the four groups were preceded by an animal symbolising one of the four evangelists: a steer for Saint Luke, a lion for Saint Mark, an eagle for Saint John and an angel for Saint Matthew. Just days prior to the spire's collapse, all of the statues had been removed for restoration. The Gothic cathedral was a liber pauperum, a "poor people's book", covered with sculpture vividly illustrating biblical stories. During the early days of the cathedral, the vast majority of parishioners were illiterate. The statues and imagery were used to convey Scripture before the written word was common. One notable tympanum is the illustration of the Last Judgment. We are grateful and humbled by these religious artifacts, and the legions of faithful it has drawn nearer towards the work of Christ’s church. May the events of this week glorify the Church and bring blessings to his followers around the world. Just as the cathedral contains timeless treasures, we are building a sanctuary here in Fairfield, Pennsylvania. We are building a simple community, but one with solid foundations. Our little village is being constructed with 14th century building techniques. These huts are being built using raw stone, carefully cut and stacked to form the four walls. These buildings will used for shelter and gatherings, with few modern amenities. Many homes and gathering places built in this way 500 years ago in Europe are still in use today. With providence, we are seeking to finish our community and create a monument that will last for ages. Our monument is for that of a living gospel, expressed through the deeds and works of the sisters here. Construction has officially begun on the next building at the Fairfield Carmel. Just a few days after warm weather arrived, BestLine construction equipment arrived at the site on Water Street in Fairfield and earth started to move. Currently, the site is undergoing a new layout. Construction vehicles moving earth and stone from the site have become a common occurrence. A HYDREMA Articulated Truck travels in and around large piles of stone, loaded by a Doosan 235 Excavator. A powerful machine, it is capable of moving as much dirt in a single scoop as a worker could dig in a full day. Jim Baddorf of Bestline helped workmen reach construction milestones, such as advising the right machines for the job. Having the right tools are essential for meeting the challenges of the project and staying on track. One of the major milestones will be the new Recreation and Work Rooms (Vestry). This construction will pose many challenges before it has been completed. Some four hundred loads were hauled with the Hydrema Truck over several weeks. James Asbury excavated the foundation, as William Johnson drove each load of stone and earth away, relocating the material into an immense pile elsewhere on site. Asbury, who attended the Pennsylvania College of Technology, is the primary Operator on the site. Referring to locking himself out of the Large 235 Excavator early one Monday morning, he said, “most salesmen would not make a trip out to bring a key at 7am on a Monday. It was a great help”. Soon the mud will be drying and the stones will be flying. Another milestone for the Carmel of JMJ is approaching, as this building starts to ascend toward the sky. Soon the Vestry, with its Recreation and Work Rooms, will be ready to be put to use. Pictures provided by Jim Hale photography. To view other photos from his collection, enter the password “carmel”. Ron Neil, a stonemason, about working on the monastery in Fairfield. Ron is a builder from Massachusetts. He is one of the many capable hands working diligently on this project. His role is that of an instructor, teaching other stonemasons with his skills and years of experience. After meeting the Mothers, they asked him if he’d like to stay on the building project. He agreed. When asked about working with his crew, he mentioned that they all came from different backgrounds and styles of building, yet they all came together for this. “I would do it again”, he says matter of factly, in his baritone voice. “What could that be?”, Mass attendance joked, fingers pointing toward the bright orb in the sky. “Don't look at it, you may scare it”, they laughed. Over the treeline in the East, the sun rose higher in the once hazy skies. Frozen ground turned to mud will soon return to sweet green grass and flowers at the little convent in Fairfield. Once busy workmen plowed snows and slush away from roads before services, now could get to other tasks on the grounds. Patrick Lemmon and his crew spent much of the cold months inside the stone Guest Cottage, diligently working away. Now they have emerged into the sunshine like bears after a long winter’s nap. The Cold winds may be brutal, but the end is near. Action has begun. Ground for the next building has broken and other building and construction plans are underway. It's Spring at the Monastery. Like others in the world, the nuns plan a large garden. Spring plants and seedlings will soon sprout. The warm soil will be crawling with earthworms under the spades and plows of busy hands. The goal of the mothers is to create a sustainable farm for self sufficient produce. The chickens will be at it - scratching and providing eggs. There is even talk of a cow joining the little community. With so many things to do this year, the mothers would need donations of plants and seeds to establish their small farm. You can find the requests here, at the volunteer sign up page. Growing organic produce can be a time consuming task. Chemicals and hormones added to the soil are expensive and impractical. The mothers wish to make the most of Spring in a natural way, more connected to the Earth created for us. Please join the Nuns in praying this Novena. It is an original hymn written by the Nuns of Fairfield. Your favorite work in Heaven is to help us here below. And send the funding that we need to make these buildings rise. Build this house of God. 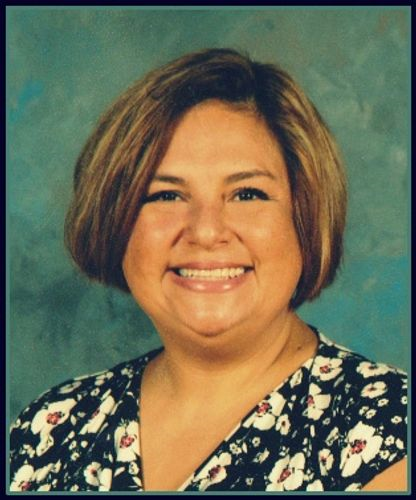 A rich example of loving God with every breath. Come visit us with blossoms eternal, with heavenly aid and gifts of grace. Our Nuns are in the land down under! Just a few days ago, four of our Elysburg Nuns have made the journey all the way to rural Australia! After a year and a half of fundraising, planning, and approvals, they have officially moved into their new home. The Diocese of Willcania-Forbes welcomed the Nuns with wide open arms - its Bishop was in fact the one who invited them in the first place. 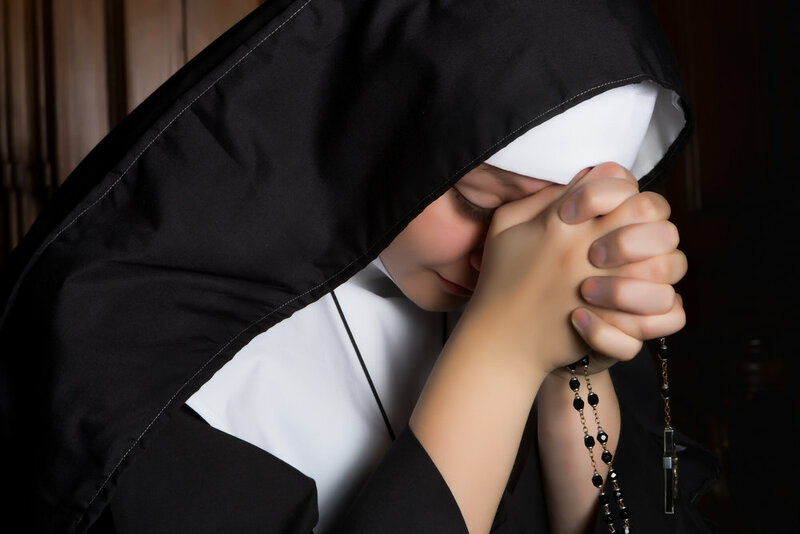 Mother Mariam Joseph of Jesus Crucified OCD, Sister Frances Teresa a Jesu Hostia OCD, Sister Juana Teresa of Jesus OCD and Sister Maria of the Incarnation OCD are the founding members. 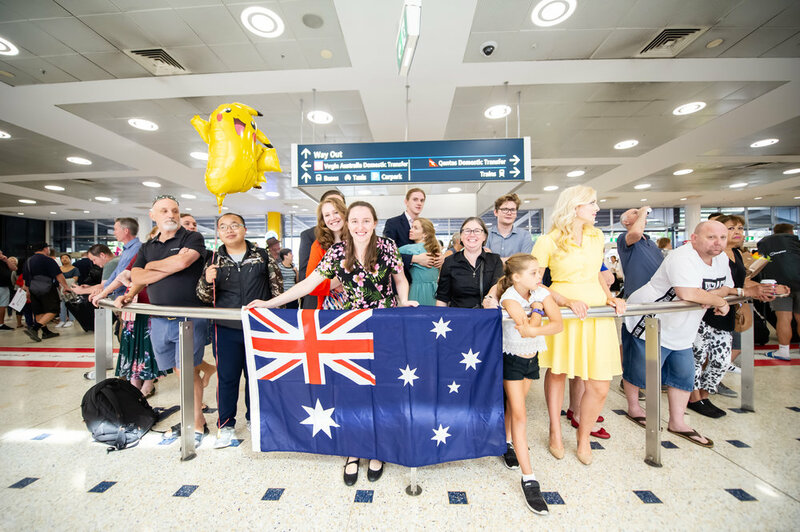 Two of them are from Australia and are now returning home; but for the other two, this is an exciting new chapter in their lives! They are becoming, in a sense, missionaries for Christ! On the way, they stopped and visited with the Valparaiso monastery. 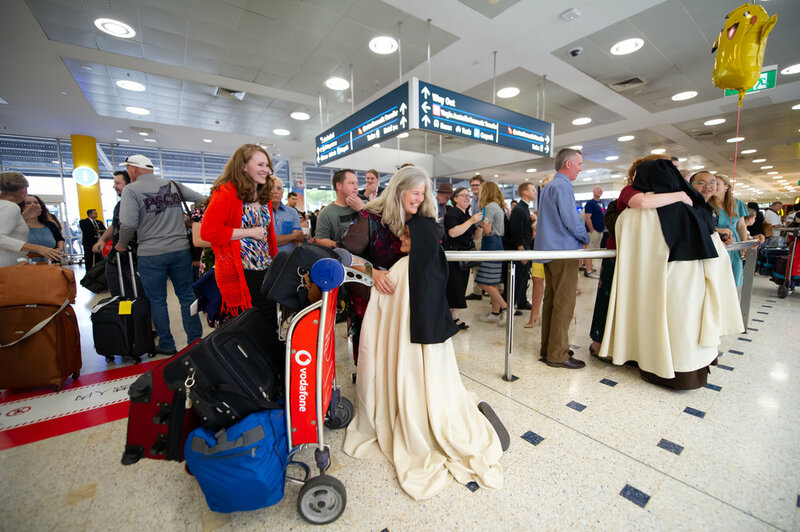 From there, accompanied by Valparaiso’s chaplain and the Lincoln Diocese Vicar for Religious Life, Monsignor Timothy Thorburn, the four nuns flew into Sydney, Australia. They were greeted by excited family and friends at the airport. 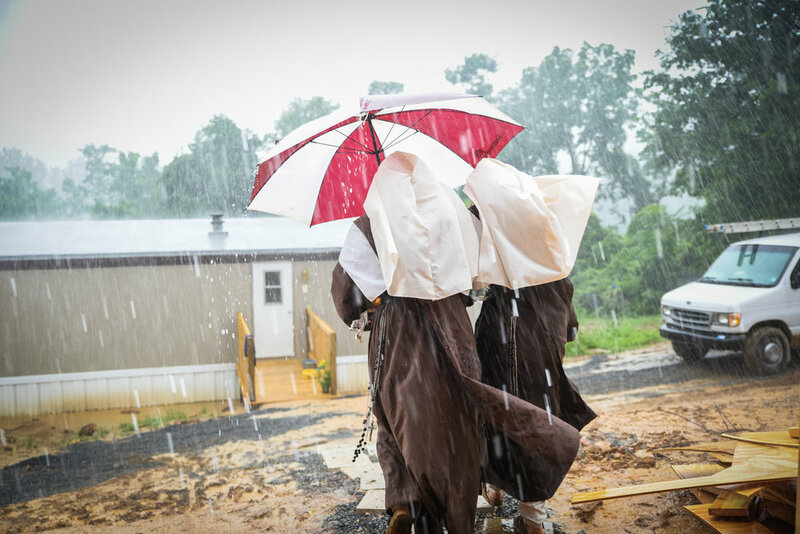 Monsignor Thorburn spoke with The Catholic Weekly and put it so eloquently when he said the Nuns’ presence will bring untold blessing to the diocese and the country. This spring, construction begins on our next building! The Recreation and Work Rooms (Vestry) building is 3750 sq. ft, and will be built in the same style as our guest cottage - using only reclaimed wood and structural stone masonry. It is the largest building so far and should take approximately 12 months to finish. Minimal plumbing and no electricity, the building will be heated by wood burning stoves and have a rain water system. The plastered walls will keep the building cool and in the summer, and warm in the winter. Once the stone work is finished, local craftsmen will handmade the windows and doors, while timber framers will complete the structure, and the interior by Patrick Lemmon, resident Project Manager and owner of Orthodox Masonry. Floors and fireplaces will be built using Old Carolina Brick - a company which specializes in hand making brick. Each brick is hand moulded using the beautiful and lasting traditions of colonial craftsmanship. The roof will be finished with authentic Virginia slate. The stone masonry will be headed up by master mason, Justin Money, of Irish Rock Art. We are thrilled to have him part of this build as he brings 30 plus years of expertise to our small corner of the world. As of right now we are completing the land development and excavation begins mid-March. Stone masonry begins in May. The Nuns are so grateful for everyone’s contributions to this project - monetarily, time, in-kind donations, and prayer! We hope that these gifts will continue to come so that we can see this magnificent project be completed in the next 9 years. We have raised more than half of what is necessary to raise this Recreation and Work Rooms building. 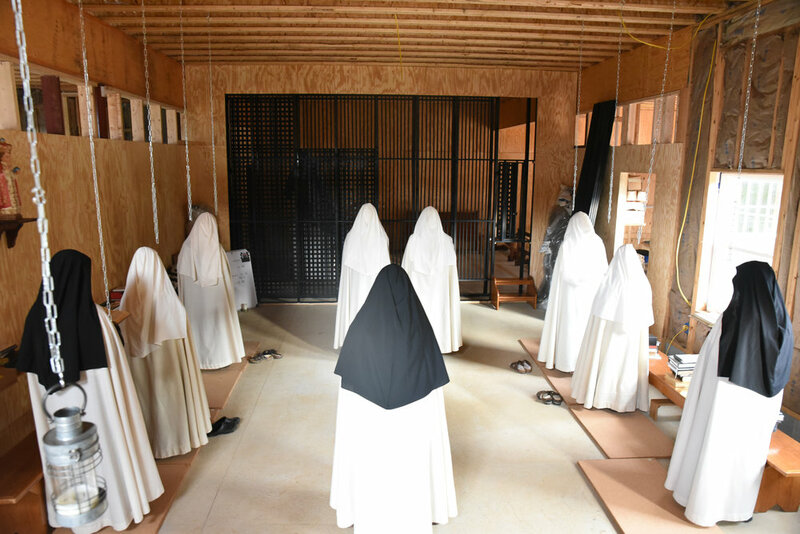 Once it is finished, the Nuns will be able to move out of the barn and trailer and into something much more suitable for living. After this building is completed, plans for 2020 will commence. Would you consider making small gift to support us in these efforts? CLICK HERE to make your tax deductible gift! The smallest building (bottom left) is our woodshed and was completed last summer. The building to its right is the upcoming Recreation and Work rooms building and will be the Nuns’ new home until the rest of the complex is completed. On November 19, the Carmel of JMJ Fairfield was honored and privileged with a visit by the esteemed Raymond Cardinal Burke! Stopping for dinner the night before at the Caretaker’s home, he then celebrated the Veiling ceremony of a newly professed nun in the morning. On a cold, grey, and windy Monday, the Solemn Pontifical High Mass was attended by over 120 faithful. Humble and gentle, Cardinal Burke spoke in his sermon on the subject of the Carmelite vocation and its integral link to the Scapular. Later, he sat down for a brief interview with Jim Hale, describing how impactful this ceremony was for him and how it would continue to be a source of inspiration in the months to come.